COLUMBIA RIVER -- The number of sea lions at Bonneville Dam continues to rise as does the number of salmon and steelhead the predators eat. This year, according to a pinniped report released by the U.S. Army Corps of Engineers April 15, the Corps' third this year, the growing number of sea lions are feeding on the fish at a higher rate than the 10-year average. And, the number of sea lions that are hanging out at the dam -- January to April 15 this year -- to feed on the fish has also risen above the 10-year average and on April 15 the number was about 70. 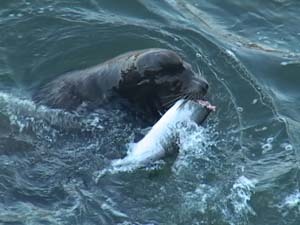 The report's expanded estimation of what sea lions have eaten this year amounts to 1,997 salmon and steelhead. Expanded estimates include non-daylight and weekend hours when observers are not on duty. On the other hand, consumption of white sturgeon has dropped dramatically from the 10-year average, although very similar to what has been observed over the past two years. The expanded estimate for sturgeon is 78. The sea lions -- both Steller (SSL) and California (CSL) sea lions -- gather at the base of the dam to feed on the fish and the numbers of fish passing the dam is growing daily, reaching 6,497 adult Chinook and 3,478 steelhead by April 20. Last year the number of Chinook that had passed the dam by April 15 was larger at 13,640 fish and the number of steelhead was similar at 3,365 fish. The U.S. Army Corps of Engineers released its third status report April 15 of pinnipeds observed at the dam so far this year, along with the extent of their menu. The report, written by Patricia Madson and Bjorn van der Leeuw of the Corps, covers the period from Jan. 1, 2016 to April 15. Steller sea lions, the home-grown version of the two types of sea lions observed at Bonneville and generally found in estuaries and coastal areas of Oregon and Washington, have been present at Bonneville Dam throughout 2016. Demonstrating the progression of their arrival as salmon make their way up the river, the daily average number of Steller sea lions observed at the dam in January was 13, 5 were observed in February and 14 were observed in March, but the highest number observed on a single day was 49 on April 15. Steller sea lions still outnumber on average the number of California sea lions at the dam. "We have documented approximately 39 unique individual SSL thus far. Of these, 36 were observed in previous years and three were newly identified," the report says. The first California sea lion was observed Feb. 26, but only a small number of CSLs were present at the dam through March. However, over the past two weeks CSL abundance has increased from an average of five per day to an average of 15 per day. "We have documented 61 uniquely branded individual CSL through April 15. Of these, 59 have been seen in multiple seasons and two were newly identified," the report says. Along with the increases in sea lion abundance, observers are seeing a significant increase in their catch of Chinook salmon, which has become the sea lions' main food source at the dam. Some 740 Chinook have been directly observed to have been taken by the sea lions: 288 by SSLs and 452 by CSLs. The sea lion steelhead observed catch has been much smaller. Just 60 steelhead have been taken, with SSLs taking 31 and CSLs taking 29. Stellar sea lions take more white sturgeon (21) than their California counterparts (3) for a total of 24, a low number when compared to previous years. The majority of sturgeon caught ranged in size from less than 2 feet up to 4 feet. The largest of the sturgeon caught was by an SSL and estimated to have been over 7 feet. A total of three lamprey have been observed being taken, with two going to CSLs. Observations are sometimes difficult, so the unknown category has grown to 55 for SSLs and 42 for CSLs. To discourage sea lion presence and predation, the Columbia River Inter-Tribal Fish Commission is continuing boat-based hazing, which it began March 7. CRITFC plans to haze Mondays, Thursdays, and Fridays. However, biologists are now noticing that hazing has a short-term effectiveness as sea lions are quickly returning after each hazing event, the report says. Sea lion exclusion devices (SLEDs) were deployed at powerhouse 2 on Oct. 26, 2015 and at powerhouse 1 on March 1, 2016. Pinniped management activities by the states of Oregon and Washington are underway at the dam. Information about these activities can be found at Oregon Department of Fish & Wildlife's California sea lion management: www.dfw.state.or.us/fish/SeaLion.